The day started innocently enough. I was itching for some trigger time, as always, so myself and my other better half decided to venture forth to our favorite indoor range in the area, Nexus Shooting, up in Davie, FL. Sometimes we bring a fair amount of equipment, sometimes we don’t. This day, I decided to keep it “light” and only bring my H&K VP9 as well as my Colt LE6920 rifle, which happened to be my first AR-pattern piece. Along the way, my Colt dropped the OEM components, added a quad rail, and a QD mount for a Silencerco Specwar 762. My fiancé bought along her Smith & Wesson M&P Shield .40. We got to the range, checked in, and set ourselves up. She went first, handling the Shield 40 with a competence beyond her 10 months of ownership. Some people say girls can’t handle the snappy .40 S&W cartridge. I beg to differ. With training and the right gun, anyone can get an acceptable “minute-of-bad-guy” accuracy out of it. We’re not competitive shooters at this time, we shoot for self-defense training and recreation. After her first string, I stepped up to the firing line, and screw on my Specwar to the Colt. Set the blue man target for 25 yards. Put in a magazine of bog-standard M193 ammunition. Stance. Aim. Safety off. Breathe. Press the trigger. Snap. No problem. Press the trigger again. Snap. Followed by my treasured Specwar flying about 25 yards downrange. The bullet hit the target, and so did the Specwar. I suppose if it were an aggressor, he’d be down with a small entry wound from the 5.56mm projectile, and maybe a nice bruise from the 2-pound piece of Stellite and other exotic alloys that hurtled at him. I set the rifle down, and stared dumbfounded at the Specwar, lying forlornly on the concrete. Every scenario ran through my head, hoping sincerely that it was a baffle strike and that the tube wasn’t breached. I summoned the range safety officer (RSO) and he called for a ceasefire in the bay. Most of the other customers didn’t realize what had happened, but some did, and were staring downrange as well, when the ceasefire was called. A manager came into the bay and retrieved my suppressor. Upon first inspection, my Specwar didn’t appear to be heavily damaged. There was a grey “ding” on the endcap from the paint on the floor of the bay, but thankfully the tube was not breached. Good news. I’ll elaborate in a second as to why having an intact tube is critical during a suppressor malfunction. However, I shook the can a bit, and some bits of Stellite, and presumably lead from the errant round, fell into my hand. Baffle strike. Though oddly enough, the can did appear it could have kept going without much issue. Wasn’t about to risk that, though. To confirm the issue was a baffle strike, I took the can out of the bay to Nexus’ resident gunsmith. He confirmed the baffle strike, and declared the can in need of repair. Thankfully, a repair was possible by Silencerco, especially since the tube wasn’t breached. I may be covering ground that many of you already know, but for the sake of clarity, I’ll get into it. Here in the US, suppressors are very restricted items for us regular guys and girls to own. Despite Hollywood saying otherwise, suppressors are legal for civilian use in 42 states, with the main hurdles being on purchase. Due to the National Firearms Act of 1934, each suppressor must be registered with the ATF, and a $200 tax stamp for the transfer (the purchase) must be paid. Your legal documentation requesting ownership of the suppressor is examined by the ATF (by hand), and a background check is performed. There is a huge backlog of people wishing to purchase a suppressor, so it often takes many months for the ATF to clear your purchase. I deliberately skipped over the bit about trusts, individual purchases, and so on in the interest of clarity…I’ll cover that in another post. Anyways, according to our friends at the ATF, the “serialized part” of any firearm is the firearm. The serial number on your pistol is probably on a steel tab on the underside of the receiver. You can buy all the slides for your GLOCK to your heart’s content without a background check, but purchasing a new receiver requires a background check. Same with an AR - you can buy one Spike’s Tactical lower, which requires a background check, and then you can buy a whole range of uppers to suit your fancy, none of which require a background check. Some firearms serialize the upper, while still others serialize every major component. In general though, the main serialized part is the firearm, by the letter of the law. Here in the US, a suppressor is a firearm, according to the ATF. Yes, a tube with some funny baffles is considered the same thing as a pistol. Well, if one were to be truly accurate, it’s treated the same as a machine gun. So anyways, the serialized part is the tube. 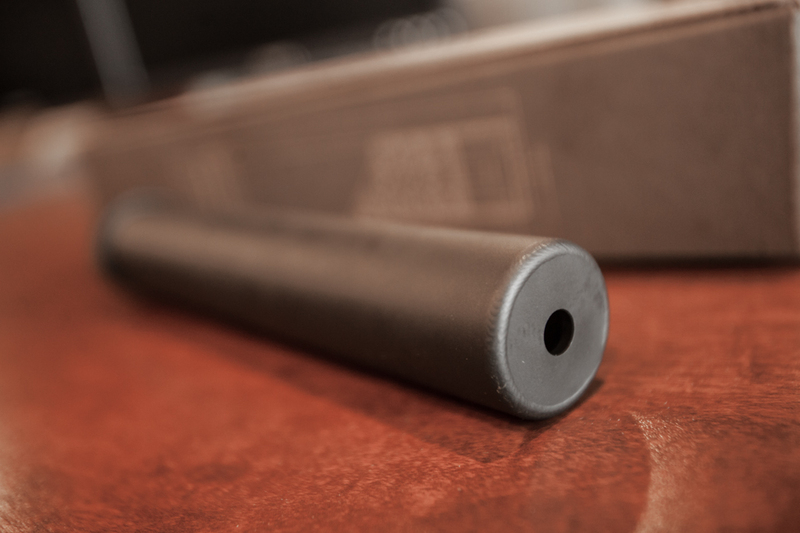 Suppressor manufacturers know this, and they strive to make the tube the most resilient part of the suppressor. Why? Because if the serialized part is maintained, the internals, i.e. the baffles, can be replaced and repaired at will, without much in the way of legal nonsense. Though there is a quirk in the law that also says that any part of a suppressor is a suppressor, i.e. you can’t have baffles lying around unless you are a licensed manufacturer. But for my purposes, an intact tube saved the day. If the tube was fragged, I’d be SOL, and I would have had to purchase a new can, with the resultant (even more so now because of ATF Rule 41F ) wait time, of course. Anways, after the resultant mishap, I actually kept on shooting. I still had a fully functional pistol, and my Colt still ran just fine. Besides, I had a new Lancer L5AWM magazine to test out. Verdict - go get one, they’re great. I disregarded the damaged can for the moment and forged on. I don’t think if the SHTF, the opposition is going to stop while I gripe about my damaged suppressor. Little lesson there, even for the range. If you gear messes up, deal with it (safely - drop that mag, leave the action open, etc…) and move on to the next phase of your session. So, after that on Monday, I got ahold of the fine folk at Silencerco. I know this article sounds a little gushy about them, but for the record, I have zero affiliation with Silencerco other than as a customer. The result of the brief conversation was simple. Silencerco would examine the suppressor, ensure the tube was intact, and replace the baffle stack and quick-detach mechanism. They didn’t even really care how it happened, as their lifetime warranty will “fix stupid - once”. I was issued an RMA, and told to box it up, with a copy of my Form 4, and FedEx it off to West Valley. Now, there’s a wait time of course. Suppressor repair is a pretty precise science, and with the Specwar, due to it’s impressive durability, the repair did take a few days. The repair itself consisted of what one would expect, a complete “re-coring” of the suppressor, and a new QD mechanism. Essentially, I got a new can for free, if you think about it. Fresh baffles, a fresh endcap, and a refinished tube. The can arrived today at my office. It was actually kind of nice to receive a suppressor direct via FedEx. Yes, if you own a firearm, you can send it in for repair to an FFL (licensed dealer/manufacturer) for repair, and they can send it right back to you. The repaired can - good as new. The interesting bit is, we never did determine what caused the baffle strike. Was it bad ammunition? A flawed muzzle device? My neglect in securing it properly? With that in mind, I have ordered a new Specwar muzzle brake to rule out all possibilities. And yes - triple-check to make sure your can is securely mounted. RGG Rating - 5 out of 5. Suppressors are hard enough for us regular guys to get. Making service and repair easy is a huge bonus. Silencerco deserves every accolade.